Ustad Rahat Fateh Ali Khan Pakistani Legendary Classical Music Singer. 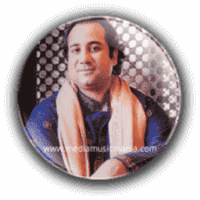 He was born on 9th December 1973, he is very popular Artist of Pakistan and he created legendary name in Pakistani Music, and Punjab Folk Music he started Qawwali, a Devotional Sufi Music with Rahat Fateh Ali Khan Albums. Rahat Fateh Ali Khan nephew of Ustad Nusrat Fateh Ali Khan and son of Ustad Farrukh Fateh Ali Khan and also the grandson of legendary Qawwali singer Fateh Ali Khan. He is great singer of Pakistan and create great name in Pakistan Music. He performed popular Pakistani Ghazals and other Classical Music, Folk Music, Lok Music. He is most popular Artist of Bollywood Music and Lollywood. He became the first Pakistani Artist to be invited at 2014, Nobel Peace Prize, to perform at its concert, he performed Nusrat Fateh Ali Khan's most memorable Qawwali. "Tumhe Dillagi", "Mast Qalandar", and "Aao Parhao", "Jo Seekha Hai Woh Sab Ko Seekhao". Ustad Rahat Fateh Ali Khan won lot of awards in Pakistan and abroad also. He is most famous Artist of the World he sung in different languages and he performed in different countries of the World and also very popular Artist of Pakistan Television and Radio Pakistan. I have selected below most popular Classical Music of Ustad Rahat Fateh Ali Khan, specially song Rahat Fateh Ali Khan Zaroori Tha.